Many of us know of the intriguing and revealing stories of Dr. Robert Wood and retired Colonel William Tompkins. The accounts of these distinguished gentlemen are among the most telling stories of modern times on the subject of off-world operations and ET life. Dr. Bob Wood was a member of the original team of the Disclosure Project. His experiences along with those of multiple members of the panel painted an extremely interesting and detailed image of the possibilities of life outside of our atmosphere and the technological developments these various beings have made. 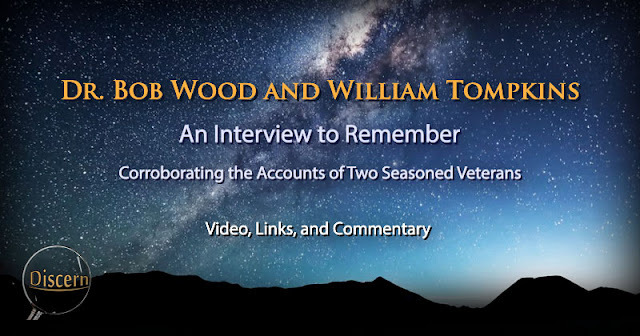 Dr. Wood verifies the accounts of William Tompkins in rather interesting ways. After these men retired from their respective fields, they learned that they were both employed by Douglas Air Company during the same time period. It tuned out that these men were working in similar fields, but due to the high level of compartmentalization at Douglas, they were not aware of one another until after retirement. They have recently met and evaluated the legitimacy of each other's accounts, and as we will see, each of their testimonies lines up well with one another on multiple levels.